Classic Elite Yarns: Two Sweaters by VKLive. Can I do it? Two Sweaters by VKLive. Can I do it? I am a volunteer this year at Vogue Knitting Live, and I can't wait to meet everyone. One problem, I need more sweaters! I am definitely a process knitter--I live to finish projects but when they're done, I'm done. Many are gifted, many live at my LYS as shop samples, and others languish in my closet. This is a problem. 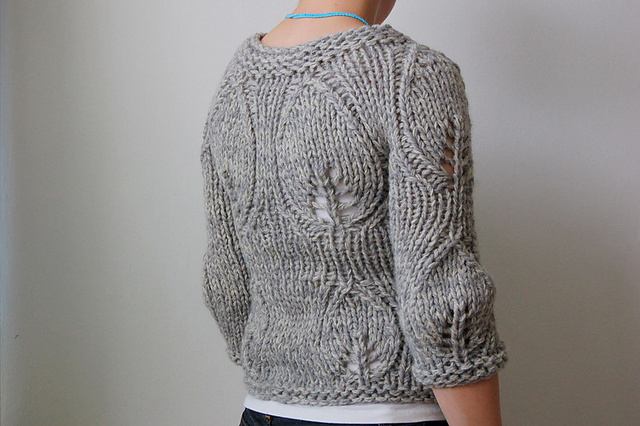 Veera Välimäki's Modern Garden Cardigan. I love this designer! A lot of her stuff is finely knit with unusual silhouettes and interesting details. This chunky knit cardigan caught my eye for its negative ease and huge leaf motifs, which I think are just so cool. I want to make it in doubled Ariosa. My gauge swatch was a little off, so I think some math might be required. Next, Cecily Glowik MacDonald's Idlewood. I feel like I talk about her designs fairly often here on the blog, they're so my style. I opted for Kumara and had serious gauge issues, which I was in deep denial about. I took it off the needles and onto some waste yarn and tried it on, one of the beauties of top-down construction. I was pleasantly surprised to see it fit, but the cowl neck is a little less drapey than I want it. Maybe some aggressive blocking is in order? As you can see, I'm almost done. 18 inches or bust! Then onto the sleeves, which are short cap sleeves FTW! Here's hoping that publicizing my mission will help me motivate, I have 9 more days. Will I make it? I LOVE that top sweater. I want one. Now!!!! I Love the jacket on the chair. What is that pattern? Can you share it? Same question as the two comments above. What is that sweater? That is actually the Elizabeth cardigan designed by Cecily Glowik MacDonald for our Fall 2010 Liberty Wool booklet! It was designed for Liberty Print, but I did it in a solid color, Gold. We've had it on the blog a few times, its a fabulous pattern and it looks great on everybody! Chelsea, you are a crazy woman!! And we love you for that! Love the jacket on chair. New Year, New Changes on our Website!